Hal the robot boy is convulsing. His head shakes back and forth so rapidly, it looks like he’s vibrating. His eyelids droop over his blue eyes and his mouth is ajar. He makes no sound, other than the faint whirs of his motors. Hal was built to suffer. He is a medical training robot, the sort of invention that emerges when one of the most stressful jobs on Earth tumbles into the uncanny valley. No longer must nurses train on lifeless mannequins. Hal can shed tears, bleed, and urinate. If you shine a light in his eyes, his pupils shrink. You can wirelessly control him to go into anaphylactic shock or cardiac arrest. You can hook him up to real hospital machines, and even jolt him with a defibrillator. Hal—which is just now coming onto the market—is so realistic, and these scenarios so emotionally charged, that the instructors who run him in medical simulations have to be careful not to push things too far and upset trainees. 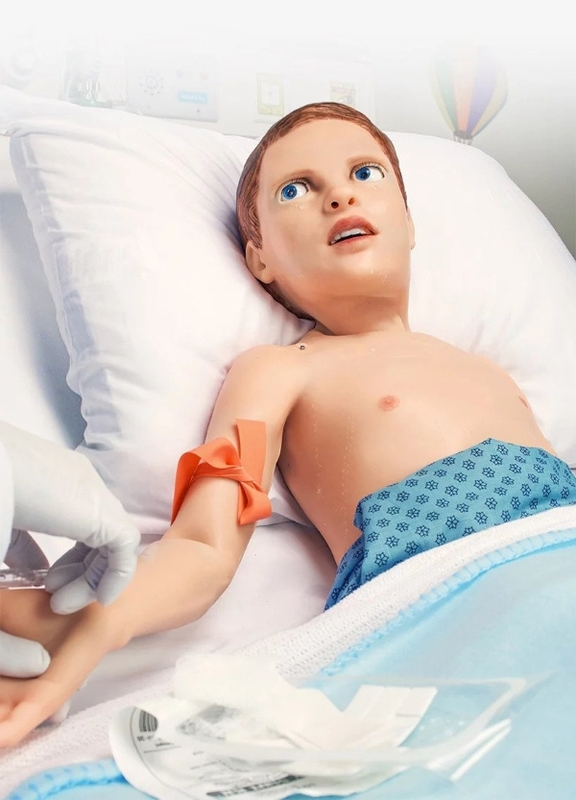 The company behind this $48,000 robot boy is Gaumard Scientific, which has been developing medical simulators since the 1940s, beginning with synthetic skeletons and anatomical figures. Now, though, the company’s tech has become much more interactive with Hal’s extended family of humanoid robots. Victoria is a robotic woman who gives birth to a baby robot. And Super Tory is a newborn that can help nurses learn to watch for signs of illness in real babies. Inside Hal, a combo mechanical-pneumatic system makes him breathe, and a cartridge in his leg allows him to exhale CO2. Hydraulic systems provide fake blood and tears. Servo motors tug on his face, helping him to look angry or scared, among other emotions. He even speaks, with a repertoire that includes shouting for his mother and telling you not touch him. If you like, you can even speak through the robot, with a system that turns your voice into that of a 5-year-old. One of the reasons for building Hal was to train medical workers on how to approach children, who may not be forthcoming about their symptoms. “They can often do that by facial expression,” says James Archetto, Gaumard’s vice president. To get the expressions right, the company’s engineers worked with pediatricians to fine-tune how an angry or happy child’s face really moves—muscles contracting here, brows furrowing there. To avoid a faceplant into the uncanny valley, Hal’s designers decided not to give him blemishes or freckles—he has to convince trainees he’s real enough to be an effective tool, but not so real that he becomes a distraction. What Hal does have, though, is a functioning nose and mouth. “In certain situations such as anaphylaxis, his tongue will swell, his throat will swell,” says Archetto. Medical trainees can even cut a small slit in his throat to practice inserting a tracheal tube to re-establish an airway. During an old-school simulation on a rubber dummy, the trainees would have to check with the instructors to get critical readings. They would answer back from another room through a microphone called the Voice of God: “You do not feel a pulse.” Which tended to ruin the magic of it all and pull participants out of the simulation. Hal, on the other hand, automatically gives trainees a mountain of readings, thus keeping the wizardry alive. As with any simulation technology, be it virtual reality or other advanced mannequins like a rather more gory dummy with realistic internal organs, the robot is a tool, not a teacher. In the end, machines can’t teach us about the often overwhelming emotions and stress in medicine—our fellow humans can. “I think that’s going to add an emotional layer, a challenge that we as educators have to be prepared for,” Su adds. Welcome to the uncanny valley, future physicians.